Non, je ne les connais pas. Ils ont l'air sérieux a priori, ils ont 4 étoiles sur 5 sur ForexPeaceArmy (site de notation des brokers de référence aux Etats-Unis: http://www.forexpeacearmy.com/public/review/www.hotforex.com). En tout cas ils ont des régulations solides (CySec, MIFID et FCA). J'ai ouvert un compte micro chez eux. Tout ce passe bien pour le moment. Qu'est ce qui t'as attiré chez eux? J'invite Over à s'exprimer sur ce sujet car il est plus expérimenté que moi. Par conséquent, les services myHotForex peuvent assister à des perturbations périodiques. Clients ne seront pas lésés par tout moyen autre que la non-disponibilité périodique des opérations myHotForex. Nous vous prions de gérer toutes les opérations myHotForex ce jour en conséquence. Alors que nous sommes désolés pour les désagréments causés par une telle démarche, les améliorations de la maintenace du système permettra une expérience de négociation beaucoup plus efficace. Si vous avez des questions, n'hésitez pas à contacter notre équipe de support client via email , chat en direct ou par téléphone au +44 2033185978 . Fund Your VIP Contest Account - Only 4 Days Left! Fund Your Account with only $250 and be the one, along with a friend, who will enjoy the most prestigious and luxurious award to date! Visit http://www.hotforex.com/en/contest/vip.html to register, fund your account and find out more information about the contest. Sujet du message: Race to Rewards Predict and Win Competition! HotForex celebrates its sponsorship of Tio Ellinas, with the launch of a new contest! Anyone can join in and its fun and easy! You simply need to predict where the price of a selected list of financial instruments will be by December 1st 2013 and you stand a chance to win a fully loaded Hotforex Trading account with $5,000! Prove your financial acumen and win big! HotForex is pleased to announce the launch of the highly anticipated PAMM V2 program. HotForex New PAMM system brings all clients more transparent and user-friendly account management service, together with increased security of funds to Investors and flexibility to Fund Managers. Sujet du message: HotForex releases the PAMM V2! PAMM V2! A new improved version of its Successful PAMM Program. We are pleased to announce the launch of our Flex Bonus Program which includes the re-launched 100% Credit Bonus and the newly launched 30% Rescue Bonus. •Effectively makes the Stop Out on Cash Balance (Balance excluding Credit Bonus) zero. •Full bonus amount withdrawal under the right conditions. •Can be used as increased leverage. •Can be lost so it can actually protect accounts from Margin Calls and Stop Outs during drawdown periods. •Effectively makes the stop out level on original balance as zero. Sujet du message: HotForex Re-Launched VIP Contest - Join Now! Win an experience of a lifetime and some cash to go with it! Registration for the VIP Live Trading contest is now open. HotForex is proud to announce the re-launch of its most prestigious and luxurious contest to date. The lucky winning participant, along with a friend, will receive an all-expenses paid trip to Cyprus where they will step off a first class plane and into a limousine to arrive at a five star resort for three nights. Win $5000 real cash prize! One-on-one four hour professional course! Limousine to a 5 star Hotel! Real cash prizes also available for the 2nd, 3rd, & 4th place winners! Registrations ends on January 15, 2014. Visit http://www.hotforex.com/en/contest/vip.html in order to register for this contest and find out more information about it. Sujet du message: Re: HotForex Re-Launched VIP Contest - Join Now! HotForex VIP Contest – Join NOW with ONLY $250! Win $5000 cash prize – An ALL-expenses paid trip to Cyprus to + meet your Broker – One-on-one four hour professional course – First class plane! Don’t miss the opportunity to win the most prestigious and luxurious contest to date! "The opportunity of travelling and meeting your broker was never so close! Your next journey destination is there where your broker is." We are pleased to announce the addition of two exciting new offerings to our shares range. With the addition of Twitter and Hilton, HotForex now offers traders access to the shares of 35 of the most successful companies in the world (all of which can be traded on 10% margin). HotForex is pleased to announce the expansion of our trading services with the launch of our new Binary Options arm, OptionTrade. As one of just a few binary options brokers to be fully licensed and regulated by CySEC, OptionTrade aims to enable clients to invest in the financial markets quickly and easily with minimal effort. Binary Options have grown in popularity over the past few years as they offer a simple way for traders to diversify their investments. OptionTrade’s highly intuitive ProTrader platform allows traders to choose from over 200 financial assets and invest in just one click by simply predicting whether the price of a particular asset will rise or fall. To register please visit http://www.optiontrade.com. Please note that this service is powered by HF Markets (Europe) Ltd (CySec Regulated) therefore clients of HF Markets Ltd (FSC Regulated) will need to register seperately via the dedicated account opening form of OptionTrade. If you have any questions please do not hesitate to contact OptionTrade’s dedicated customer support team via email, live chat, or by telephone on +357-24-400561. Hot Forex is pleased to announce the expansion of our trading services with the launch of our new Binary Options arm, OptionTrade. As one of just a few binary options brokers to be fully licensed and regulated by CySEC, OptionTrade aims to enable clients to invest in the financial markets quickly and easily with minimal effort. Binary Options have grown in popularity over the past few years as they offer a simple way for traders to diversify their investments. OptionTrade’s highly intuitive ProTrader platform allows traders to choose from over 200 financial assets and #invest in just one click by simply predicting whether the price of a particular asset will rise or fall. Sujet du message: HotForex "Kami Akan Datang Ke Indonesia"! 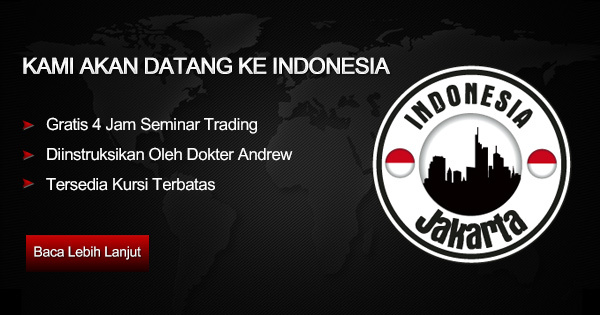 Gratis 4 Jam Seminar Trading diinstruksikan Oleh Dokter Andrew! Diperuntukkan bagi siapakah seminar ini? Seminar 4 jam ini dirancang untuk semua trader / investor yang sangat serius dan peduli dengan mencari kapan saat yang tepat untuk masuk dan keluar pasar. Peserta akan memiliki kesempatan untuk "Berjalan Melalui" metodologi terstruktur yang unik dalam membangun sistem perdagangan mereka dengan probabilitas yang tinggi untuk entri dan exit point. Rumus keberhasilan akan diungkap dan dijelaskan secara rinci bersama dengan contoh-contoh langsung di platform trading MT4. Andreas Thalassinos, BSc, MSc, MSTA, CFTe, adalah dosen terhormat dalam pendidikan trader, investor dan profesional FOREX. Kecintaannya pada trading mengarahkannya untuk belajar kondisi pasar dari sudut pandang matematis dan mekanis. Dia merupakan seorang penasehat dinamis trading algoritma dan telah mengembangkan ratusan sistem otomatis, indikator, dan alat trading. Produk tradingnya saat ini digunakan diseluruh penjuru dunia oleh para trader, investor, perusahaan FOREX dan broker. Ia meraih penghargaan sertifikat profesional internasional, MSTA oleh perkumpulan Analis Teknikal, Society of Technical Analysts (UK) dan CFTe oleh International Federation of Technical Analysts (USA). Tesis penelitian terbarunya berjudul "Anatomi trend: Swing chart, High points dan Low points, Peaks dan Thoughts dan bagaimana susunan mereka bisa menentukan kekuatan perkiraan mereka." not make the cut. So how exactly do you know who is the best and who isn't? You do your research and a lot of it. We are delighted to announce that HotForex is now listed on the prestigious World Finance Top 100 companies (http://worldfinance100.com/), alongside companies such as Apple, Samsung, Coca-Cola, MTN, Credit Suisse and Morgan Stanley. The World Finance Top 100 companies recognises “industry leaders that have carried the flag for global commerce” and we are honoured to have been selected. Sujet du message: HotForex Wins Best Forex IB/ Affiliate Program Award! HotForex adds yet another award to their trophy cabinet after winning the ‘Best Forex Affiliate Program’ title at the prestigious International Finance Magazine Awards in Dubai. The Best Forex Affiliate Award is presented to the IB/ Affiliate Program that offers partners an outstanding opportunity to earn significant commissions, optimise their profitability and successfully achieve their potential. The 11 HotForex Titans are professional trading teams that successfully manage substantial amounts of client money on a daily basis, employing trading strategies designed for safety and long-term growth. Now, as a retail investor, you can easily diversify your investments and, as a result, reduce your risk, by allocating funds to several Titans simultaneously*. J'ai mis à jour mon avis sur le broker HotForex. Je trouve très positif que le broker se soit régulé à Chypre en plus de Maurice, c'est mieux pour les traders européens. En plus de ça j'ai mis à jour les performances de leurs signaux de trading. Visit http://www.hotforex.com to explore the new website. HotForex | The right tools for your next Trading Mission! Hotforex has the right tools for your next trading mission: technical analysis; trading calculators; myHotForex Client Area; Traders Board; 1 click trading; VPS hosting; video tutorials; forex education and, much more! Take a look at our latest video, which was shot in London, UK and visit http://www.hotforex.com to learn more about our innovative trading tools. HotForex is with you every step of the way! Enjoy fast execution on your desktop and on-the-go via your mobile device, breaking market news and in depth technical analysis; multilingual support around the clock, comprehensive educational resources designed to improve to trading performance and the peace of mind that your funds are kept securely in segregated accounts at global, investment grade banks.